During a sometimes contentious confirmation hearing Wednesday on his nomination to lead the Environmental Protection Agency, Acting Administrator Andrew Wheeler was pressed by members of the Senate Committee on Environment and Public Works about the impact of the government shutdown on the agency. Wheeler noted one casualty of the ongoing partial government shutdown, now in its fourth week, is that a long-awaited long-awaited plan on regulating the PFAS group of chemicals has been delayed. Fluorinated PFAS chemicals include PFOA, or C-8, which has been detected in several water systems in the Ohio Valley. Some municipalities in Ohio and West Virginia have been dealing with C-8 contamination for decades. EPA has previously said the management plan would recommend whether some of these widely-used toxic chemicals used to make non-stick items should be declared “hazardous” under the federal Superfund law. If the agency takes this step it could gives states more options for cleaning up contamination. The agency has said it is also considering whether it should set legally enforceable limits for PFAS in drinking water, a move that has garnered bipartisan support. Ranking Committee Member Tom Carper (D-Del.) pushed Wheeler to commit to the action, as did West Virginia Sen. Shelley Moore-Capito (R). In an exchange, Capito said she “couldn’t tell” from Wheeler’s earlier statements on the PFAS plan if the document would contain drinking water limits. “So, that’s a no?” Capito asked. “I can’t go into the specifics of what’s in the plan because it’s currently in inter-agency review,” Wheeler replied. Wheeler’s comments come after months of EPA efforts to highlight the issue. Last year, the agency held a nationwide meeting on PFAS contamination and a series of public listening sessions across the country. Some environmental groups have expressed concern the agency will downplay the issue given the Trump Administration’s goal to roll back many environmental regulations. Last year, a draft report from the Agency for Toxic Substances and Disease Registry, a part of the Centers for Disease Control, was blocked by federal officials. It found these fluorinated chemicals can endanger human health at levels 7 to 10 times lower than the EPA’s current recommended exposure limits. The agency’s point person for the PFAS plan, Peter Grevatt, director of EPA’s Office of Ground Water and Drinking Water, retired from the EPA in December. 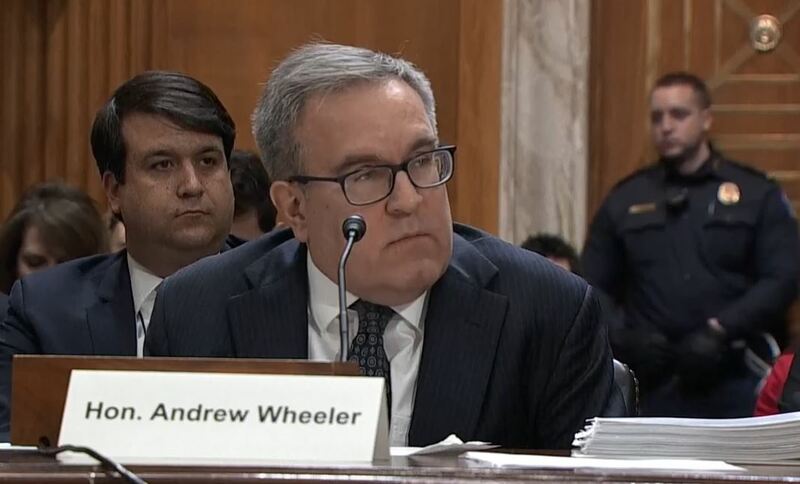 Wheeler also faced tough questions from Democrats on his beliefs over climate change and the extent to which, if confirmed, the EPA under his leadership would focus on reducing heat-trapping greenhouse gas emissions. Multiple lawmakers pointed to several high-profile rules issued by the agency last year — including the Affordable Clean Energy Rule and Clean Car Rule — where EPA’s own analysis shows carbon emissions will increase. Sen. Sheldon Whitehouse, a Democrat from Rhode Island, questioned the nominee on his relationship with his most recent former employer, coal company Murray Energy. After leaving the Senate in 2009, Wheeler worked as a lobbyist for at the D.C.-based law firm and lobby shop Faegre Baker Daniels. One of his clients was Murray Energy. During the hearing, Wheeler said for the last four years he worked with Murray Energy he worked exclusively to shore up the pension fund for the United Mine Workers. Murray has been an outspoken critic of the Obama administration’s EPA and its efforts to limit greenhouse gas emissions. Weeks after President Donald Trump’s inauguration, Murray gave the White House a wish list of environmental rollbacks, many of which have now been completed. Whitehouse sought more information on Wheeler’s involvement in the so-called “Murray Action Plan,” including whether he sought a meeting with then-EPA Administrator Scott Pruitt. “Can you tell me now how many meetings with officials for Bob Murray did you arrange, attempt to arrange or attend and with whom?” Whitehouse asked. After prodding, Wheeler said two — a March 2017 meeting with Energy Secretary Rick Perry and one at the White House. He reiterated he had not attended nor set a meeting at EPA to discuss the plan. The response did not seem to satisfy Whitehouse. After 35 days of the partial government shutdown, President Trump announced from the Rose Garden at the White House that he will sign a legislation reopening the government until February 15. President stressed that he is still committed to obtaining the funding for the wall on the southern border that he originally requested. Trump encouraged both sides of the aisle to work on a compromise during that time, but stressed that if there is no agreement on border funding, the shutdown might resume, or he might use special prerogatives to build the wall. 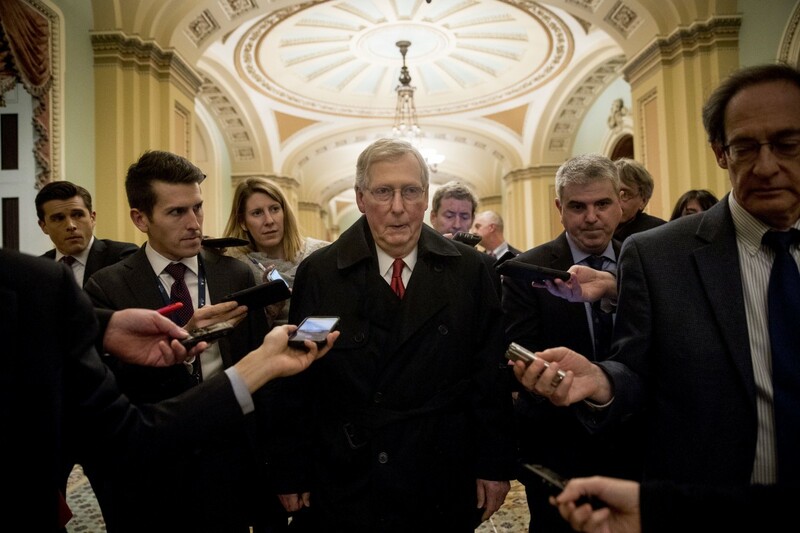 That leaves members of Congress just three short weeks to hammer out a deal, with both sides already ideologically entrenched. Nearly 800,000 federal employees are going without a second paycheck today as a quarter of the federal government remains shuttered. Senators rejected two measures Thursday that could’ve ended the partial government shutdown, one that would’ve funded the government through early February, the other– backed by the White House– that would’ve funded the president’s $5.7 billion border wall and extended some protections for Deferred Action for Childhood Arrival, or DACA, recipients. The most talked about effects of the shutdown are those on furloughed or unpaid government workers, many of whom are struggling to make ends meet, and on the safety of the nation’s air travel, with air traffic controllers warning of increased risk due to mandatory overtime and increased stress. There are about 145,000 federal civilian workers in Virginia, 120,000 in Maryland, and about 18,000 in West Virginia, according to the U.S. Office of Personnel Management, although some are considered essential and were not affected by the shutdown. Still, there are more subtle, perhaps still hidden effects of the shutdown that are rippling from within the beltway out into Appalachia. Rich in both agriculture and heavy industry, the after-effects of the partial closures of the Department of Agriculture, or USDA, and the Environmental Protection Agency, or EPA, could take much longer to see. For now, the USDA has taken precautions to provide Supplemental Nutrition Assistance Program, or SNAP, benefits to those who need it by paying out February benefits early. Beyond that, however, there is no solution. What goes overlooked, though, are the community-based initiatives USDA provides, like the mobile farmers’ markets that deliver fresh produce to elderly and other vulnerable populations in rural areas with restricted access to fresh produce. The Charleston Gazette-Mail reported on one such program in Mason County, West Virginia, a county with a population just over 26,000. There, one of the farmers described her inability to accept payments from customers using EBT cards, which are like credit cards that food benefits are loaded onto. When she approached the USDA to resolve the issue, there was nobody there to pick up the phone. The money to help these residents buy food is there, but when trained personnel who solves problems for farmers and other food providers aren’t, vulnerable populations are in danger of going hungry. There are even more complications for farmers in the region, many of whom have applied for grants with deadlines falling squarely in the middle of the shutdown. They’ve been left with speculative assurances that work on their applications will resume right after the shutdown is resolved. Then there are farmers who experienced a federally declared disaster, but can’t apply for USDA’s disaster loan programs to aid in their recovery, or cattle farmers who’ve lost excessive numbers of animals due to weather or diseases amplified by weather conditions. If their application’s 30-day deadline for the Livestock Indemnity Program overlapped with the shutdown it might now be floating somewhere in its limbo. Similar problems plague the domains overseen by the EPA, which is working at bare bones staffing levels. Among its furloughed employees are environmental inspectors who monitor compliance by different industries and businesses with federal environmental regulations. It’s difficult to assess the full impact yet, mostly because of lack of any open communication lines. And because EPA’s regional offices are largely shuttered, requests for information from the agency on the impacts of its closure– requests sent to two regional offices that contain 8 of 13 Appalachian states– went unanswered. For that matter, inquiries sent to the Region 3 Quality Assurance Bureau also were never addressed, but, in one case, 100 Days did receive an automated reply explaining that due to the shutdown, the bureau’s communications employee is not at work. Without anyone overseeing the agricultural and environmental needs of the region, what will the long term implications be? Although not as widely known, the government shutdown could potentially disrupt a federal agency that’s a giant economic driver for the region– the Appalachian Regional Commission, or ARC. Those impacts are minimal for now, but, depending on the scope and length of the shutdown, some more long-term projects could be put at risk. “When departments like USDA and Commerce close, it impacts our ability to partner with them on projects,” ARC’s Communications Director Wendy Wasserman said. “In some cases, mostly on infrastructure projects, USDA manages our grants at the state level,” she added, which means that in some cases, ARC money flows through the USDA, who oversees the overarching grant and individual payments to grantees. If employees responsible for these operations are furloughed it’s not exactly clear what happens, according to Wasserman. And that’s the case in many parts of the partially closed government. It’s not exactly clear what happens next for them either. For President Trump, South Carolina’s Senator Lindsay Graham said in a speech from the Senate floor Thursday that the White House is ready to move forward with a discussion on passing a continuing resolution that would reopen the government for three weeks while negotiations over comprehensive border security continued. The short term deal could help many in Appalachia who worry about missing another paycheck or the release of their SNAP benefits, but the longest shutdown in American history might instead turn out to be a new technique in this administration’s negotiating tactics. With the Republican-led Senate unwilling to pressure the President into more moderate positions, it’s left those feeling the effects of the shutdown to wonder if that tactic will become a new variable to be considered every time the president moves to fulfill one of his campaign promises, despite political opposition. Editor’s Note: This story initially contained an incorrect calculation of the proportion of federal workers impacted by the shutdown in three Appalachian states, as reported by the New York Times. It has been updated to include the total number of federal workers in Virginia, Maryland and West Virginia. 100 Days in Appalachia’s Food and Culture Editor Mike Costello contributed to this report. President Donald Trump wants $5.7 billion to fund a border wall to keep out undocumented immigrants and “criminals.” Democrats in Congress say the wall is a waste of money that wouldn’t solve any of America’s actual immigration programs. Caught between the two sides are about 800,000 federal workers whose agencies are affected by the partial government shutdown. And although it started about three weeks ago, Jan. 11 marks a significant milestone: It’s the first time affected workers didn’t get their paychecks. As a researcher who studies people’s wealth, I understand that while the loss of a single paycheck may not seem like much, for many American families it can be devastating financially. Overall, the federal government directly employs more than 2 million people. Most of them work for departments such as Defense, Education and Labor that remain open because Congress passed spending bills fully funding what they do. About a quarter of the federal government – including the Departments of Homeland Security, Justice and Agriculture – has no new funding, leaving 800,000 workers in the lurch. About 380,000 have been furloughed without pay, while 420,000 are deemed essential and have to report for work. However, these essential workers are not being paid either. And on Jan. 11, they felt the impact of that lost pay. So what’s the big deal if these workers don’t get a single paycheck? The problem is many Americans both in and out of government live paycheck to paycheck. Estimates range anywhere from one-third to more than three-quarters make ends meet every two weeks. No matter which figure is right, it means that many American families cannot financially survive for long without earning money. And a significant share don’t have enough money to absorb even a $1,000 emergency expense – let alone a prolonged period of time without a paycheck. 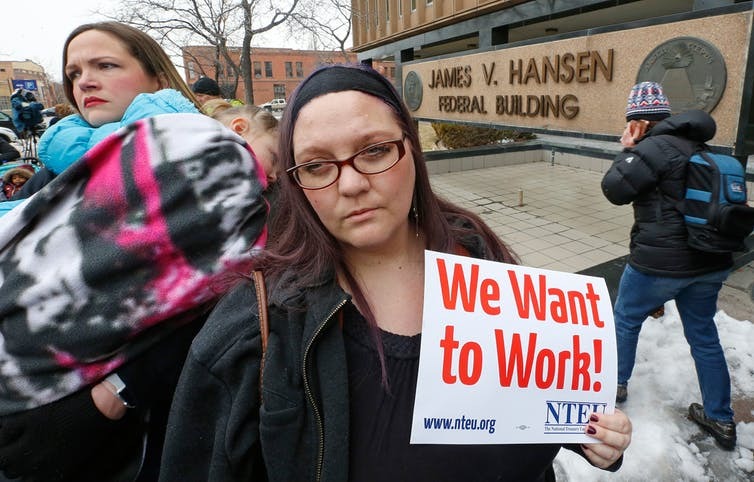 There’s some good news for government workers who have been furloughed. They are eligible for unemployment insurance, a federally mandated, state-run program that protects workers’ incomes when they lose their job through no fault of their own. Workers who sign up for unemployment insurance can receive a portion of their wages for up to half a year. For example, Virginia tells federal workers they will get anywhere from a minimum of $60 to a maximum of $378 a week if they ask for benefits, depending on their past salary. Washington, D.C., offers up to $425, all taxable. But even the maximum is barely a quarter of the weekly equivalent of the average federal salary of $84,000 per year. Essential government employees inspecting bags at airports or guarding the president, however, have a much tougher problem. They are not eligible for unemployment insurance, which means their only recourse is drawing on their savings – if they have enough – or taking out a loan. Going without a paycheck for a few weeks is hard enough. If the shutdown lasts months or years – as Trump has threatened – the situation could get very dire for the average government worker. And while Congress is required to eventually pay those who worked during the shutdown, there’s no guarantee that it will pay workers that it forcibly furloughed. While it’s hard to know when this shutdown might end, the good news is that Congress tends to give all affected workers back pay, regardless of whether they worked during the impasse. That’s what happened in 2013, when lawmakers unanimously approved paying everyone back.